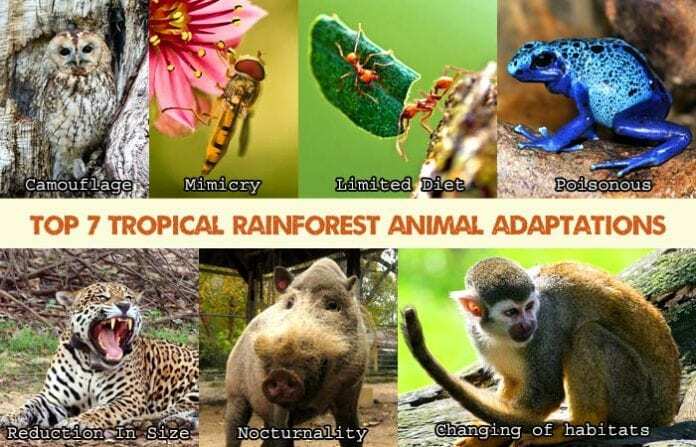 Tropical Rainforest Animal Adaptations : Tropical rainforests, because of their location near the equator, cover only a small area on our planet. Interestingly, this region is hugely oozing with biodiversity as it contains more than half of the world’s plant and animal species. The tropical rainforest is hot and humid, but the substantial amount of rainfall yearly makes it an ideal environment for life. But with great competition for natural resources, how do animals living in this environment adapt for survival? 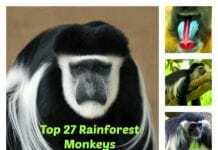 In this article, let’s explore top seven tropical rainforest animal adaptations: camouflage, mimicry, having a limited diet, poison, reduction of size and stature, and changing of habitats with illustrations. The first and most common animal adaptation in a tropical rainforest is camouflage. For an animal to successfully exhibit this adaptation, it needs not only to have a color that will help it blend into the environment but also a shape that is unrecognizable by its predator. One good example of an animal practicing camouflage is the Green-eyed tree frog (Litoria genimaculata). This frog has developed flaps of textured skin around its body in order to resemble the barks of trees on it lives. Another similar example is the Leaf-tailed Gecko (Phyllurus cornutus) which exhibits camouflage by having a skin similar to tree bark covered with moss. Another good example is the young Southern Cassowary (Casuarius casuarius) which have an overall plumage color of light brown with stripes of black. Such adaptation helps the cassowary to blend in the vegetation it lives on. During adulthood, the cassowary becomes fully black. Despite being advantageous in escaping predation, hiding through camouflage bears little significance from a predator’s highly sensitive smell and impressive eyesight that can detect even the smallest movements its prey. Check out all about leopard geckos here. With the very dense vegetation and little amount of sunlight that can pass through the tree canopies, animals can easily hide in the rainforest. But instead of hiding, some animals resort to the adaptation called mimicry where they tend to look like something that is intended to be seen (and not hidden like camouflage). While seemingly alike at first glance, one major difference between camouflage and mimicry is that the latter does not only involves the resemblance to the physical appearance but also to the behavior of other larger and more fearful organisms. 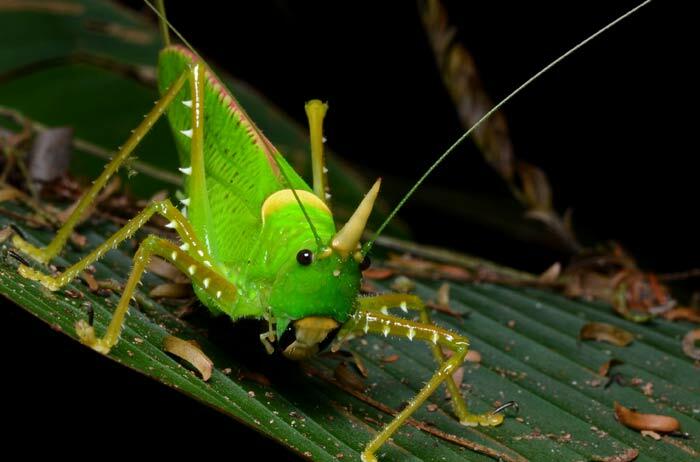 An example of the animal exhibiting mimicry is a katydid (Aganacris pseudosphex) which do not only appear like a stinging wasp but also behaves like it. 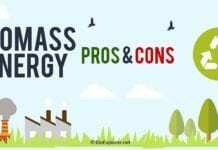 Unlike the wasp that has a venomous sting, the katydid is just pretty much a harmless relative of grasshoppers, and basically, it knows nothing about the venomous sting investments of a wasp. The weirdest kind of mimicry is known as the Browerian mimicry that involves the animal copying other animals of the same species. While this adaptation still confuses scientists, it is believed that it reduces the possibility of the predator eating its potential prey. The rainforest is exceedingly full of natural resources but the competition for these is also great. To avoid such competition, some animals have developed an adaptation wherein they reduce the choice of food they consume. Most of the animals that have reduced their diet are the bird species. 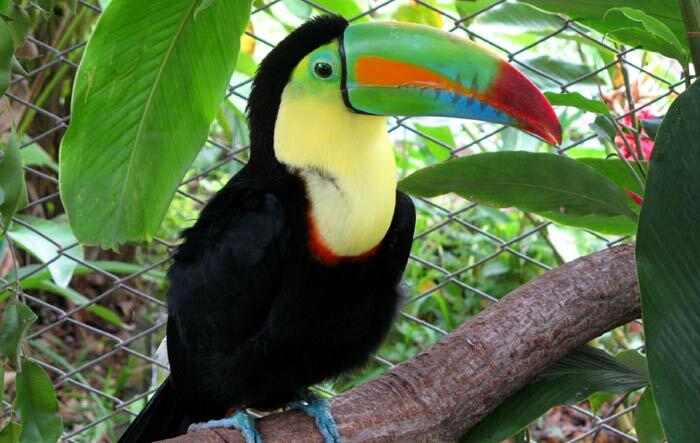 The Toucans (Ramphastidae family) only consume fruits that other animal and even bird species cannot access. Along with this adaptation, their beak also had to become long and narrow to crack these fruits open. Another example is the Leaf Cutter ants (Tribe Attini) which are known for their ability to carry objects that are multiple times heavier than their bodies. Every day, they carry pieces of leaves from the high trees to their habitats underground. They bury these underneath the ground and consume the fungi that arise as the leaves decompose. Aside from the production of poison per se, some tropical rainforest animals tend to have bright colors and distinct patterns to scare their predators. Poison dart frogs (Family Dendrobatidae) come in very bright colors of yellow, red, green, and blue adorned with spots and swirl patterns. These bright colors are an indication to predators that they need to stay away or they will be poisoned. Interestingly though, some dart frogs are not at all poisonous but they remain unharmed because they look like their poisonous relatives. Lobster moths also exhibit this adaptation by looking like the venomous scorpions during its larval stage. They have patterns in their wings which look like the eyes and such keep them unharmed. So instead of relying on hiding in the darkness and bark of trees, animals with poison can just freely hop without being bothered of being eaten. Despite being huge in terms of area, the tropical rainforest only favors smaller animals because its understory (the layer above the forest floor) is so dense that it makes large movements hard to execute. Hence, animals adapt to this by reducing their body size and stature? 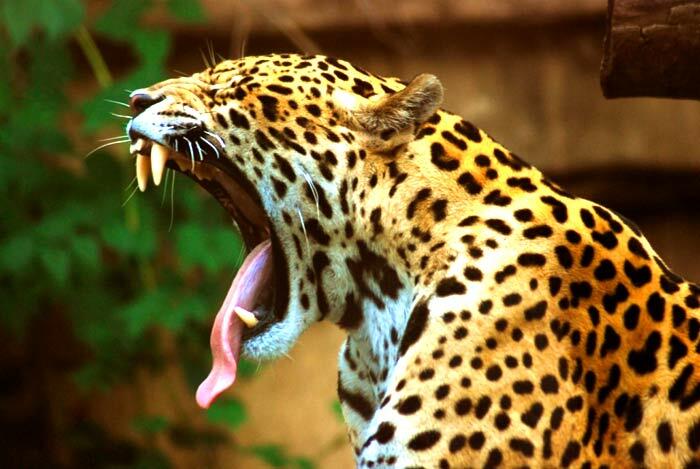 In a tropical rainforest, the jaguar (Panthera onca), the world’s largest species of cat, tends to grow only less than six feet long and weigh just about 200 pounds. Such small built allows it to acquire the speed needed to hunt for food. However, snakes are an exception to this rule. Snakes in tropical rainforests can grow larger than anywhere else in the world because they can fit in the spaces between trees and even underground. Tropical rainforest snakes can grow up to 20 to 30 feet long. In general, we can see that the limited area for movement is one of the main reasons why large animals like the lions, zebras, giraffes, and elephants prefer to thrive in the savannas. Another adaptation developed by rainforest animals is nocturnality. Basically, nocturnal (in contrast to diurnal) animals are active during the night and are usually asleep or resting during the day. 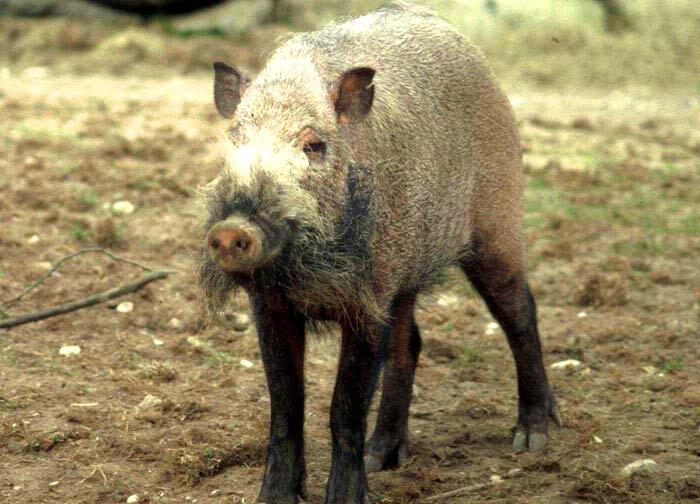 The bearded pig (Sus burbatus) is a dark brown pig with a beard and somewhat resembles an Airedale terrier. While normally active during the day, pigs of these species resort to nocturnality when they migrate within the tropical rainforest. When they do this, they usually travel in groups (called herds) in the forest floor. On the other hand, from a predator’s point of view, nocturnality provides a great advantage for food which seems to be nowhere during daytime (i.e., other nocturnal worms and mammals). Additionally, nocturnality also reduces competition as most predators hunt during the day. Opting for nocturnality requires animals to enhance their other senses because sight is of course useless. Some animals have developed stronger smell, better hearing, and other organs like heat sensing ones. The tropical rainforest is a home to numerous towering trees. Hence, to make use of this great advantage, some animals tend to climb up the canopies and live there. One example of this adaptation is the spider monkeys (Genus Ateles)that have chosen to live at the tree canopies to avoid great competition in the under-story. 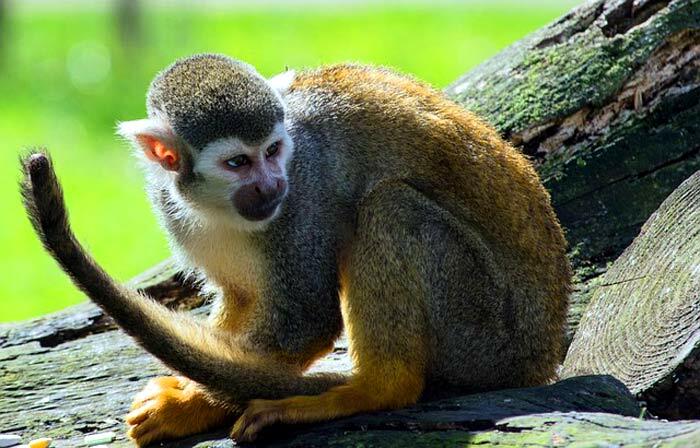 These monkeys have developed tails capable of grasping that allow them to swing freely among trees. Sloths that live by hanging upside down from high branches of trees are also an example. The rule of changing habitats is for animals to maximize their protection from their predator as well as to limit the competition for food. Whether it be using camouflage, mimicry, production of poison, nocturnality, etc., being physically adapted to the environment is an essential attribute to acquire for animals residing in tropical rainforests. Indeed, the tropical rainforest is overflowing with such diversity and discovery; if only we have the eye to look for them. Comment below if any tropical rainforest animal adaptations were missed out. 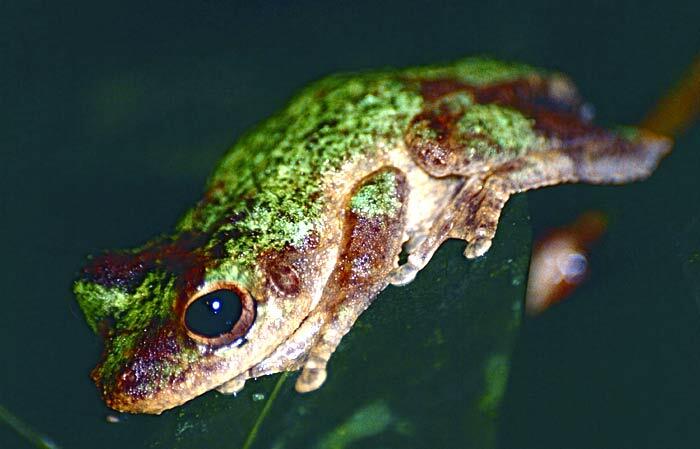 Cite this article as: "Top 7 Tropical Rainforest Animal Adaptations," in Bio Explorer by Jack Kirsten, October 18, 2017, https://www.bioexplorer.net/tropical-rainforest-animal-adaptations.html/. – “Skyrail Nature Diary – The Art of Disguise – Camouflage in the Rainforest”. Accessed October 17, 2017. Link. – “UCSB Science Line”. Accessed October 17, 2017. Link. – “Incredible rainforest mimicry | Wild Tropics”. Accessed October 17, 2017. Link. – “Skyrail Nature Diary – Mimicry in the Rainforests of the Wet Tropics”. Accessed October 17, 2017. Link. 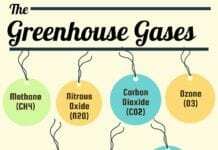 – “Adaptations of Animals in the Tropical Rain Forest | Sciencing”. Accessed October 17, 2017. Link. – “Toucan | National Geographic”. Accessed October 17, 2017. Link. 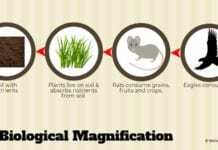 – “leafcutter ant | insect tribe | Britannica.com”. Accessed October 17, 2017. Link. 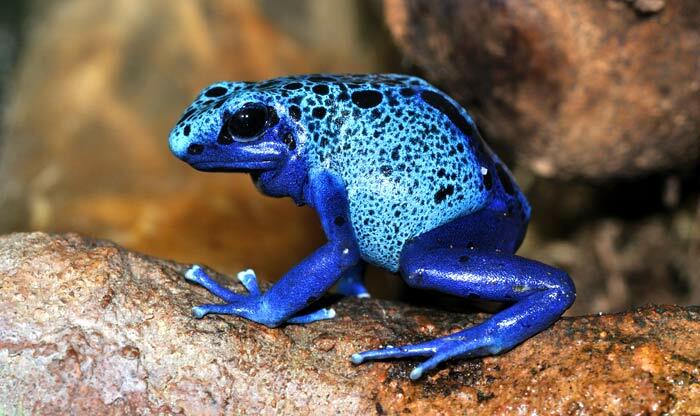 – “Poison Dart Frogs, True Jewels of the Rainforest • Rainforest Animals”. Accessed October 17, 2017. Link. – “Rain Forest at Night–From National Geographic (Rain Forest)”. Accessed October 17, 2017. Link. – Tropical Topics by An interpretive newsletter for the tourism industry. Accessed October 17, 2017. Link. – “Spider Monkeys | National Geographic”. Accessed October 17, 2017. Link.